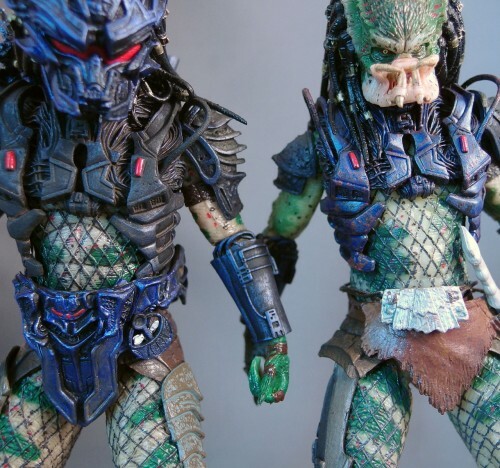 In order to produce as many different Predators as possible, NECA has spent some time mining the “Lost Predators” at the end of Predator 2. Played by Los Angeles Lakers players (who had a little fun with it offscreen), the designs for these characters were mostly variations on the designs from the first two films. Where did the outfit come from? Well, I’m not sure it’s ever been confirmed, but it looks an awful lot like the cyborg outfit Stan Winston designed for The Vindicator, a 1986 B-movie that sounds like it should be a Terminator rip-off but is more like a cross between the Swamp Thing movie and Robocop. It seems possible Winston re-used parts of the costume to make this particular Predator more distinct. I was working in New Jersey at the time, and I had often talked with Kyle Windrix, who is [NECA’s] lead sculptor, about how much we’d like to make original designs. One of our ideas was to start making variations of figures that are very popular, such as Predators. 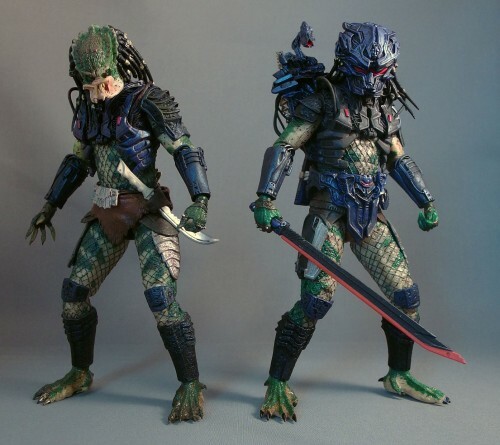 At this time I wasn’t aware of, and I believe there weren’t any plans to make things like the Kenner Predator redesigns. 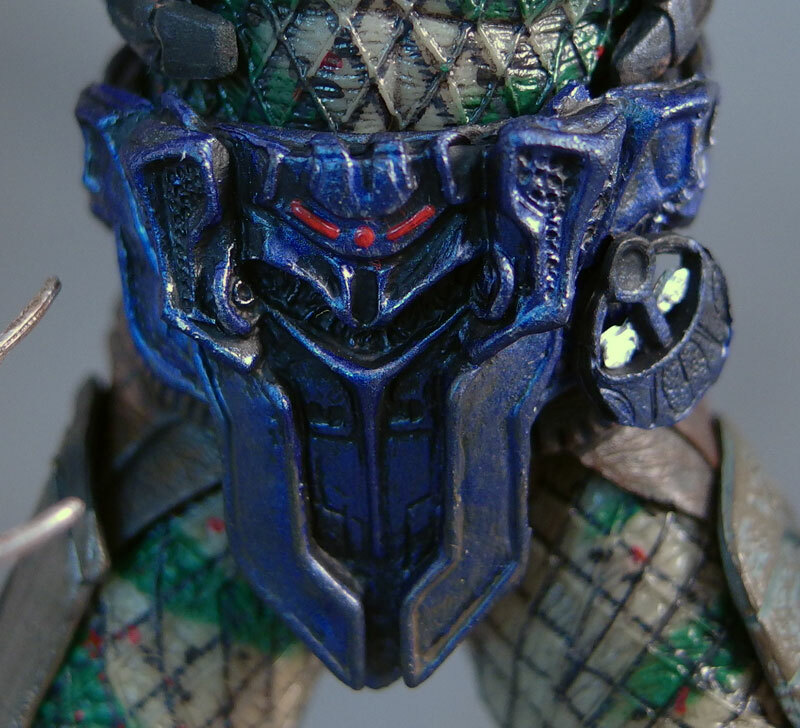 I’m not sure, it’s possible this armored Borg Predator started the Kenner Predator idea, but I don’t know. 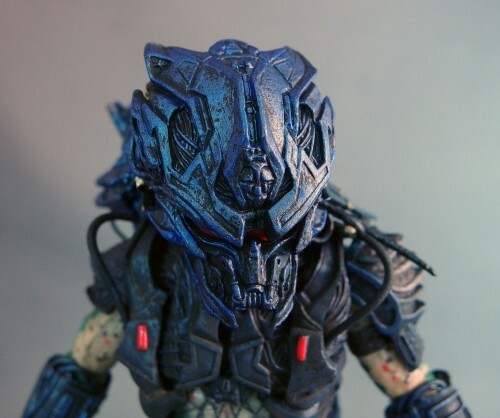 Anyway, after work hours one day, we went to the place we were staying (This would be me, Kyle, and my wife Adrienne who also sculpts) and I brought with me the Borg Predator figure because I just had this huge desire to put a mask on it. It seemed like the chest armor provided such a weird new style of potential technology if you gave him a plasma caster and mask in the same design. Kyle completely encouraged me to do it, especially when he saw what I had made in a few hours that night. The thing is a rough sculpt is always easier than finishing it as a sharp symmetrical mechanical final piece, and the project really took me a lot longer than I think we all would have liked. 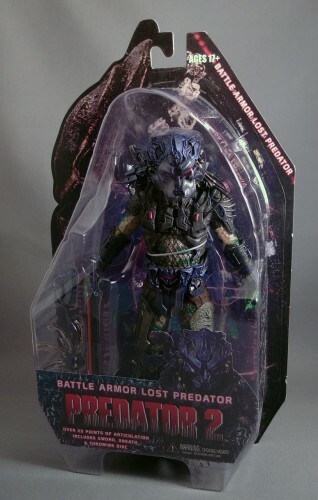 Packaging: To distinguish this version of the figure from the previous one, it’s referred to as the Battle Armor Lost Predator. It comes in the same blister packaging we’ve seen from this line since wave one. Unlike the Kenner Predators, we don’t get a new biography on the back; it’s the same brief bio given to all the Lost Predators: The Lost Hunters, a clan shrouded in mystery, travelers of both time and space. The Predators exist to hunt and they adhere to a strict code of honor where defeat is equal to death. I did a lot of Internet searching and couldn’t find any back story on him, in comics or books or anything. I even looked for good fan fiction, just because I thought it would be neat to have any tie in with other media. But it really seems like a blank slate. So I actually started to make up my own back story. I decided for myself, that it would be neat for him to be a technophile, a lot like the Falconer was described in his packaging, which I probably had in mind because I sculpted that head and parts of the body. I liked the idea that the Borg Predator basically was interested in all of the automated forms of the hunt, like the automatic tracking of the shoulder cannon. I imagined even having a constant recording of the hunt, data being transmitted back to their home ship. And he would, like the Borg in Star Trek, be making more and more of his body directly connected to his technology, so they were merging as one. I imagined that he had the unusually low tech weapon of the tribal sword, which even has a bone handle, in the movie and first figure because it was a token of his respect for the old ways, and perhaps in Yautja law you had to show that respect. But he really only carried it as a technicality, and the rest of his arsenal would be absolute cutting-edge technology, largely custom-made by him. I imagined his polar opposite would be the hippie predator or shaman predator, who would have the reverse mentality. 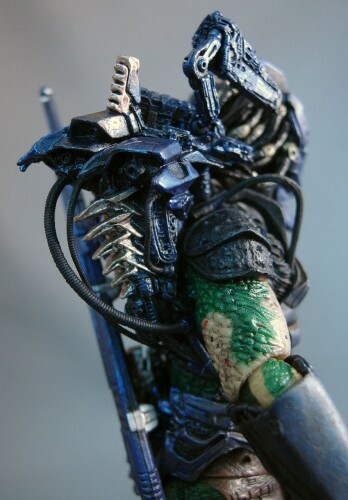 If I armored him up, I think it would be interesting for him to have say a basic plasma caster as a nod to the respect for Predator advancement in hunting, but the overwhelming majority of his weaponry would be tribal and basic: spears and blades and skins, loads of skulls, with lots of Predator writing. Design & Sculpt: This figure was sculpted by Jason Frailey, who sculpted the helmet and plasma caster, and Dave Silva, who sculpted the armor for the chest and hips (as well as the sheath and sword). While I’ll have a few things to discuss in the other sections, of the sculpting I can only say: bravo. This is a magnificent sculpt all-around, definitely worthy of the other fine products NECA has been releasing of late. The helmet alone is a wonder. It’s evocative of any number of famous cybernetic faces and masks. I like how the laser targeting emitter is way up near the top of the mask (admittedly, Jason Frailey had to point this out to me). Jason Frailey: There is some Darth Vader in there, particularly around the nose, but I mainly tried to draw from elements that I saw in the strange chest armor and to a lesser extent the gauntlets. That was my bottom line, the chest armor was all we saw of his unusual design in the movie, and it was the frame of reference that everything else needed to match. So elements will echo what you see on the chest armor: cylinders at the top and bottom of his sternum match cylinders between his eyebrows, masses of wires of course, and you will see shapes on the sides of the head that look like the rib shapes on the chest armor, which are sort of like rounded rectangular tapering shapes with little oval depressions in them. You will see this same shape in parts of the backpack, as shielding elements. Part of what was fun about his chest armor design was shapes like that seemed so weird and impractical, they could go anywhere, like a decorative design. I treated them more like he had a strange culture that used these decorative designs, sort of like we have European armor with unique designs, and Japanese armor with different designs, etc. He has a unique culture. Or possibly just a personal style. 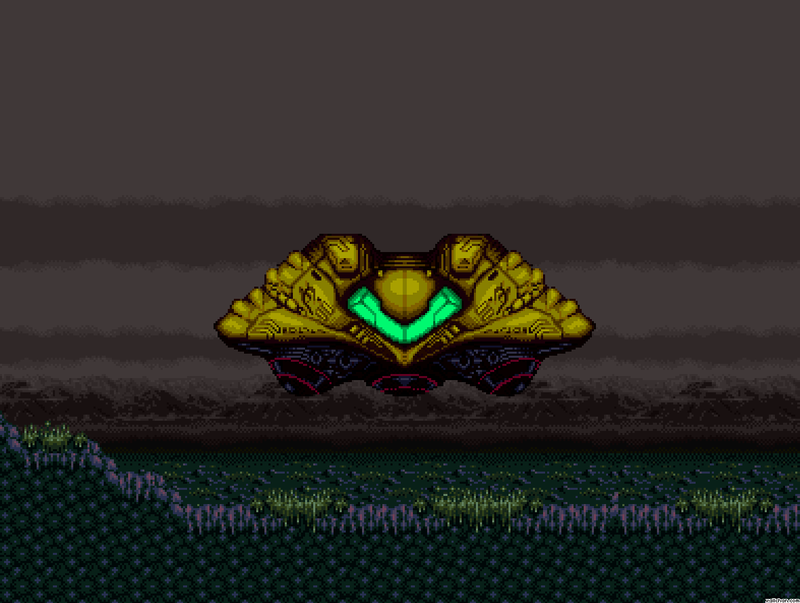 I realized after making it that some of the shapes in the backpack were probably subconsciously influenced by Samus’ ship in Super Metroid. I love that ship. Also, this area has a lot of empty circular sockets which are ripe for customization. You can add little hoses, maybe piano wire or guitar wire, and really up the number of wires in his backpack. A lot of the details, particularly on the plasma caster, were accomplished by kitbashing watch parts and small pieces of airplane kits. I thought this would be a good way to get detail and save time, but it seems to take even longer to integrate them well. The hip and pelvis armor is brand-new for the figure and quite different from that of the movie-based version. One notable thing is that the hip armor contains the same symbol seen on the Lost Predator’s throwing disc. DS: The design of the new pieces I sculpted were based on the look of the new mask and shoulder cannon made by Jason Frailey. One of our painters, Geoff Trapp, came up with some general design motifs based on Jason’s work, which also aided in my creating the new pieces. There was a lot of room for creative license and was quite the group effort – it was a fun project. 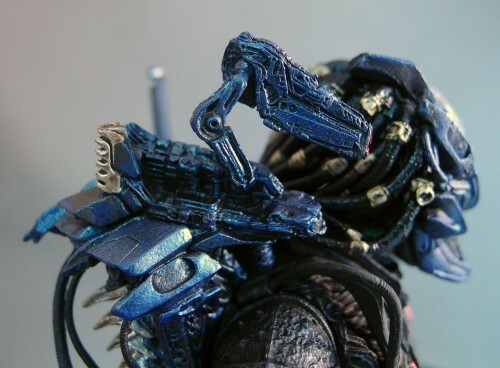 Plastic & Paint: With one notable exception I’ll discuss below, the paint work on the Lost Predator is very good. 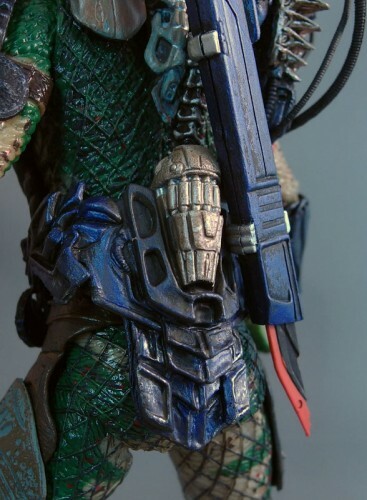 Really, “very good” is inadequate – what NECA is doing with their paint applications these days sometimes rivals what we’re seeing on high-end stuff like Hot Toys. The work on the helmet in particular is excellent. I have no idea how they colored the visor red, unless it’s a separate piece. A lot of effort has gone into making the armor pieces appear burnished and worn, and it all looks good. The green used for the flesh is a bit thick on the extremities, but that feels like nitpicking. The real problem is the chest armor. On the previous Lost Predator, it had the same burnished-metallic-blue look as the helmet and pelvis armor of the Battle Armor Lost Predator. But on the BA Lost Predator, there’s hardly any of that metallic blue (there is a tiny bit of it, here and there). Judging from the photos in his review, it appears Ridureyu’s figure is also under-painted on the chest, as is Pixel Dan’s. Obviously there are two possibilities – conscious decision by NECA or factory error. It might have been a conscious decision, because the plastic used for the chest armor on the new figure is more rubbery than that used on the previous one, so perhaps it wouldn’t take the blue metallic paint as well. 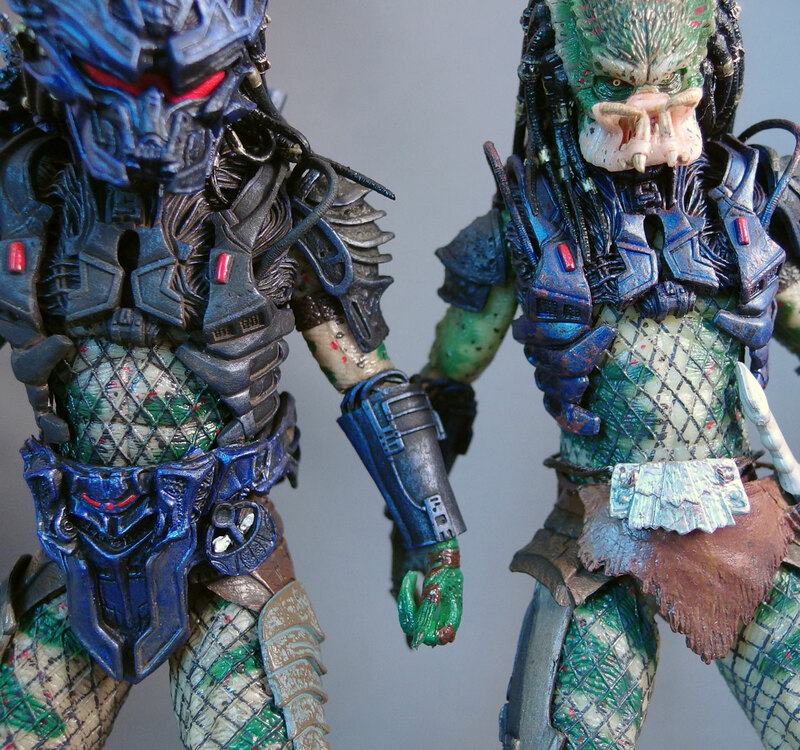 Articulation: NECA’s Predator line is one of the best examples of the almost-but-not-quite method of articulating that bugs me. Battle Armor Lost Predator isn’t an exception. That said, the articulation isn’t bad, just restricted in some places. The figure has a ball-jointed neck (I think it’s ball-and-socket) with a satisfying range of motion. The shoulders are ball-hinge and, thanks to the rubbery shoulder armor, not as restricted as you might expect. The elbows, which are ball-and-hinge, are probably the most disappointing: due to the gauntlets they have very little ability to bend. The wrists are ball-and-socket joints, which works great with the sword. I think the waist is a ball joint, but I’m not 100% sure [Jason F. confirmed that it is indeed a balljoint]. It definitely swivels. The hips are ball-hinge joints with swivel motion where they attach to the thighs. The knees are double ball-hinge joints, and the feet are ball-and-socket joints. Like many Predator figures, the articulation allows for some creativity with posing, but it’s still limited compared to, say, a Marvel Legends or Star Wars Black figure (or Dutch himself). 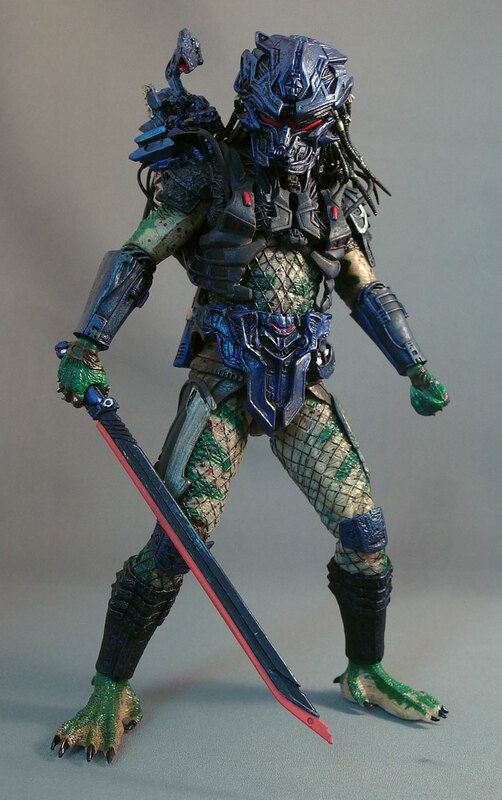 Accessories: Battle Armor Lost Predator comes with a sort of technological sword and a throwing disc. Both are new to the figure. As mentioned above, the symbol on the throwing disc matches one on his loincloth. The sword is just badass. It appears to have a hot, glowing edge, perhaps inspired by the scene in Predator where the alien sharpens his wrist-blades by heating them. The sword fits in a sheath on the figure’s back, and it’s worth noting that the sheath is quite firmly attached to the body. The plasma caster comes separate in the package and has to be mounted. It has two ball-and-socket joints, one at the base of the caster and one at the base of the mount, allowing for a great targeting range. Given the size of the mount, one has to imagine Borg’s caster packs a bit more punch than most Predator’s. David Silva: This guy was established in Predator 2 as being very tech-savvy based on his unusual torso and forearm armor and was seemingly more advanced technologically than the others in the tribe. And although it is not canon, my thought process for coming up with the additional armor and weapon was that this guy spends most of his time hunting non-organic lifeforms, a.k.a. robots, which means he’d need some different weapons. Strong general preference for melee weapons aside, a few other Predators have also had swords as well. Elder from P2 carries a sword as does the regular version of the Lost Predator. You could even say the Falconer uses a sword, albeit a wrist mounted one. So giving this guy a sword was just a way to carry on the tradition of that particular melee weapon, but it had to be more advanced. The idea is that the blade edge is heated metal, with the power source stored in the handle. Quality Control: Again, it’s possible that the lack of blue paint on the chest armor is a quality control error, although if it is it appears to be one that many figures have. It’s possible it was corrected at some point in the production run, so if you’re lucky enough to run across multiple figures at a store, look through them before making a purchase. Overall: That said, don’t let that oversight keep you from getting this figure. It’s still an amazing figure, and what’s even better is how much of it is wholly original. It fits alongside the Kenner Predators as well as it does the regular line – perhaps even better. And at $20 or less at TRU and online retailers, he’s practically a steal in today’s market. David Silva: This may be my favorite NECA Predator so far. Jason has established a whole new look for a Predator, but it is still unmistakable as the iconic hunter. And as a Predator fan myself, I’m very happy to have been a part of that. Jason Frailey: Being creative with this figure has inspired me to make my own creatures. I may do a line of toys/fantasy sculptures of creatures from our nightmares, which will be over the top designs of crazy monsters in a world where our nightmares have invaded our reality. Their designs will be scary but fun, inspired by the creatures in movies like Ghostbusters and Killer Klowns from Outer Space, and 1980s toys like Boglins and Street Sharks – creepy wrinkled realism, yet cartoonish. I will be doing that project along with Adam Smith, my wife’s brother and NECA’s mold maker, who I worked on The Walking Dead with earlier. I am also working on a undead robotic/Frankenstein world, and a futuristic police state world with my brother. Also potentially acquiring and redesigning an ’80s toy license, and I’ve been working on creature concept designs for the movie Harbinger Down with the talented people at ADI. I got that opportunity by basically buying it on Kickstarter, but it was worth it to support an all-practical-effects monster flick. So a lot of cool crap is coming along, Plus best of all, I’ve got a beautiful baby girl to play with all these new toys! I feel really lucky and excited, and I plan to blog more about the Battle Armor Predator figures and have more pictures at jasonfraileystudio.blogspot.com. The sculptor’s commentary really makes this review! it's great to hear stories of real people making cool things that they enjoy, rather than picturing some corporate d-bag screaming about making a figure coming in under margin… makes my old black heart smile. this fig looks incredible, and as you say poe, there's work coming out of NECA these days that easily rivals hot toys or sideshow at a fraction of the price. just remember that come poppies time! 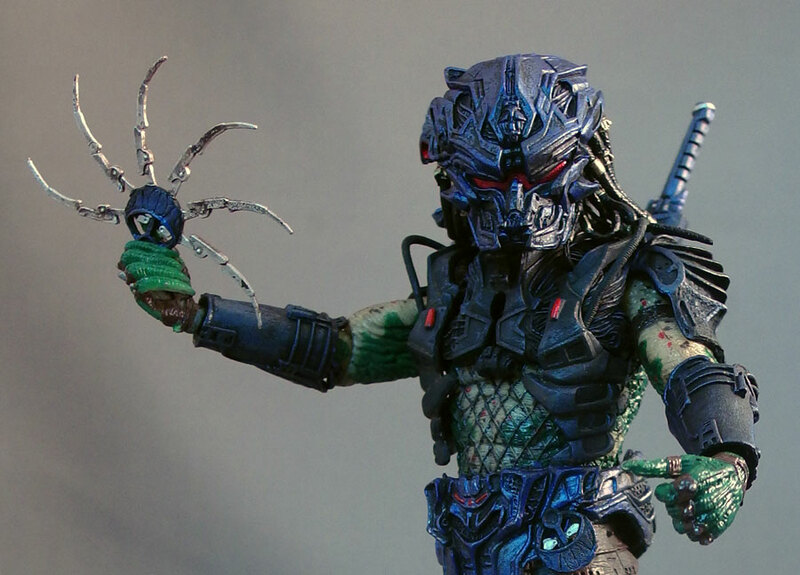 (i voted yesterday) this dude is a must own if you like cool figures, even if you're not a predator fan. He’s great! Nice review. I saw 3 of them yesterday at my local TRU. I’m sure that the chest is standard & not a QC issue. 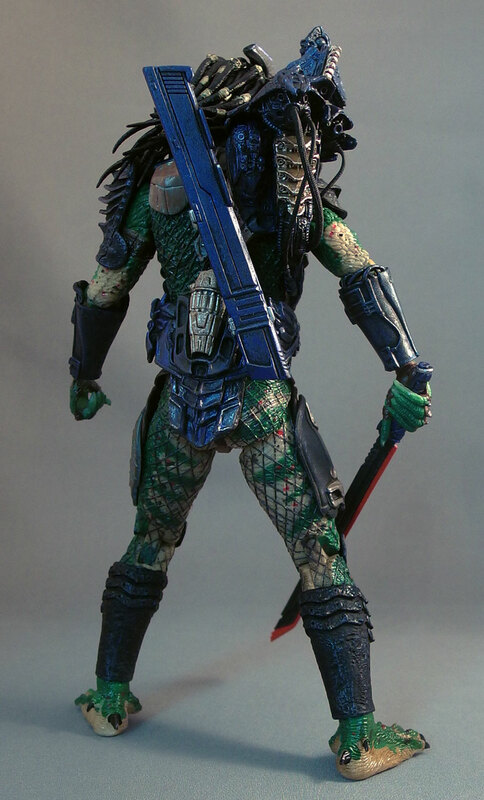 Neca predators really had me for a long time. They were my go-to line. Then the trophy wall debacle happened and I just tuned out. Kenner avp is my favorite toyline ever & I didn’t get any of the neca kenner wave. I even sold all my predators (except 3) to poe & doc! care to elaborate on "the debacle?" How the skulls weren’t included. It was a sore spot for me. I had collected everything I could a. Afford and b. Find. I felt like it was a slap in the face to collectors who live in a crappy market and have responsibilities financially past toy collecting. By the time they announced that you could buy them separately, I was over them. I never said “I’m off neca” but it definitely made me rethink collecting so much. No more trying to collect everything. I was angry but I’m much better now! What’s funny is how some people were vocally angry that the skulls were available at all, calling it a “slap in the face” to fans who had spent the time and money tracking each one down individually. Just went to my local figures store, and there were variances in the chest paint. Some definitely had more of a sheen, others were dull. That is an absolutely BEAUTIFUL figure. Props to NECA! Great review, Poe. I enjoyed the sculptor commentary. I was excited about this one, but when I saw it at TRU last week…I just couldn't bite. The head looked comically large in the package. He looked just shy of being a bobble head. I really wanted to like it. I even picked it up and put it back twice. Everything else about it did look great, though. I am so pumped to get this figure. Haven’t seen it at retail in AU yet, but I’m sure it’s not far away. NECA is doing some amazing stuff lately. Very tempted to get some Predators. Excellent review. I picked this guy up yesterday at TRU and noticed that his chest armor HAS the blue metallic paint like his helmet. They had another Battle Armor Predator and his chest armor was just brushed grey. It pays to search the pegs plus that is half the fun. 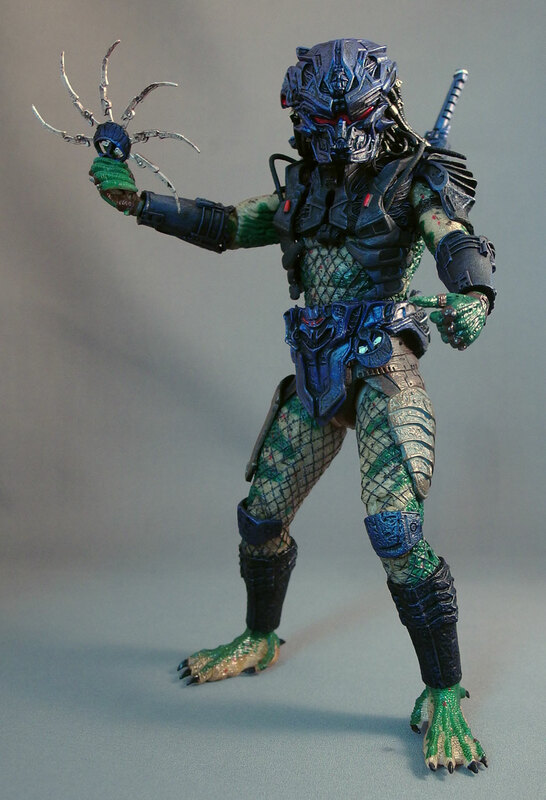 Hands down, this is my favorite Predator fig. However, these figures really need double jointed elbows with a bicep swivel, an ab crunch or ball joint in the upper midsection, and either a hinge joint in the feet or redesigned ankles (similar to most Japanese figures and current Marvel Legends and Star Wars Black figures).